The City of Langley provides a live Christmas Tree (located at Willowbrook Shopping Center, Langley). The tree is decorated with tags noting a child’s age and gender (ie: Boy 12 years or Girl 5 years). When a donor brings a gift to the Tree they are supplied with an appropriate tag denoting the child’s age and gender (ie boy 4 years or girl 10 years). The tag is then placed on the tree for decoration and to show what gifts are given and what are needed. We require un-wrapped gifts as well as gift certificates and financial donations for all children from newborn up to those still attending high school. 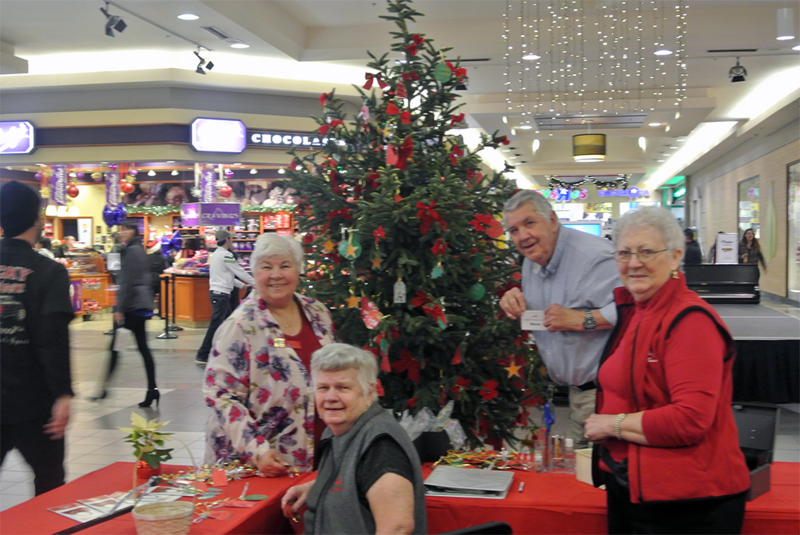 We have a team of approximately 30 volunteers who provide assistance to shoppers. This year, the dates will be from November 22 to December 13 (inclusive) and during regular mall hours from 9:15am to 9:00pm. Our volunteers give suggestions for gifts, assist with adding the gifts to the giant toy box and putting tags on the tree. The gifts are taken to the Langley Christmas Bureau and distributed to the families the week before Christmas.